On Buttertubs looking back towards Hawes. During the Tour, according to Strava Laurens ten Dam climbed in 11.20 with an average power of 365 watts. Simon Yates climbed in 11.25, with just 262 watts! Leaving the village of Hawes, there is a gentle climb away from the river valley. Then there is a right turn, signposted towards Muker which takes you on the main climb. You pass through a few houses and the gradient already begins to get steep up to 20%. The climb is then pretty unrelenting all the way to the top, though the gradient does vary. It becomes quite exposed to the elements, and can be quite windy on the upper slopes of the climb. The road is also exposed to wandering sheep, which can be a bit of a pain – they do have a tendency to run into you path rather than away from. I do hope the peleton isn’t brought down by a kamikaze sheep. After a few km of climbing, the gradient eases off, before a short section of downhill. But, this is not quite the top, as the road goes up again before reaching the final summit at 526m. 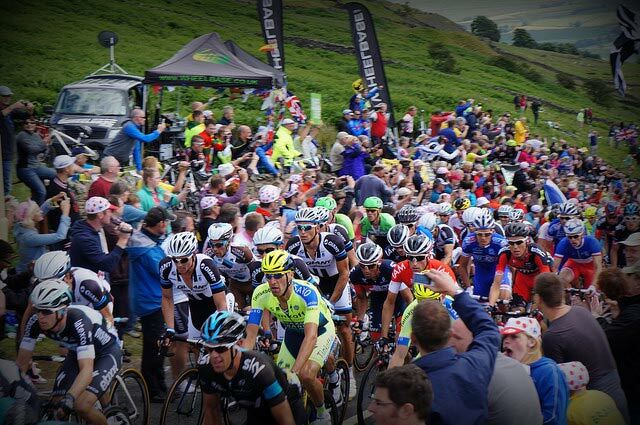 In July 2014, this isolated hill was transformed into a seething mass of humanity, as thousands of spectators lined the side of the road to witness the peleton fly up the climb. Jens Voigt had the privilege of leading the peleton over the climb as he had dropped his two breakaway partners. His effort gave him the King of the Mountains jersey for a day. If you’re not in a rush, the descent into Muker is pretty breathtaking. There are beautiful views of the unspoilt Swaledale, stretching along the river valley. The road hugs the edge of the hill making you feel on top of the world. There are some sharp steep hairpins on the way down, so stay in control of the bike. The final section into Muker is also pretty steep and you have to come to a complete stop at the give way sign. The ascent from Thwaite / Muker to Hawes is steeper and more challenging. There is an initial section of 17% taking you out of Swaledale before a brief respite and then the start of a couple of 20% hairpins. These take you high up and then there is a period of downhill before the final drag to the summit. The last section is always hard work after the legs have felt only a temporary rest during the downhill. I’ve done both climbs a few times. I prefer the climb from Hawes because I generally come from that direction. But, it’s definitely worth a trip – if nothing else it’s a beautiful part of the world. With the Tour de France visiting Buttertubs, it’s sure to become even more popular as you can go up and ride a climb of the Tour de France. Buttertubs at Velo viewer with a useful gradient chart. Tejvan, given your experience of cycling in the painful paradise of the dales, you may have come across “Fleak Moss” or “Long Road” from Askrigg to Low Row near Reeth. Of all the climbs I have ever done, I rate this as the hardest. it goes on forever (4km, 8% 310m gain), and has brutal 20% sections. Have you done it? If you have how do you rate it?